If you want to put on muscle mass, you may be tempted to hit the gym daily for hours at a time. However, this could actually work against you -- the more you work out, the more calories you will burn, making it even harder for you to gain weight. Furthermore, excessive training can lead to injury. Instead of overtaxing your muscles, develop an exercise regimen designed to help you bulk up slowly and safely. If you're a hard gainer, strength training should be your primary focus at the gym, since lifting weights helps you build muscle mass. Hit the gym for strength training four times a week and never exercise the same muscle groups two days in a row. Instead, do exercises that focus on your upper body one day, your lower body the next and then give yourself a day to rest. You can use free weights or the weight machines or even cycle between the two. Pick a weight or resistance level you can lift 10 to 12 times without stopping, working your way up to two to three sets of repetitions per exercise. 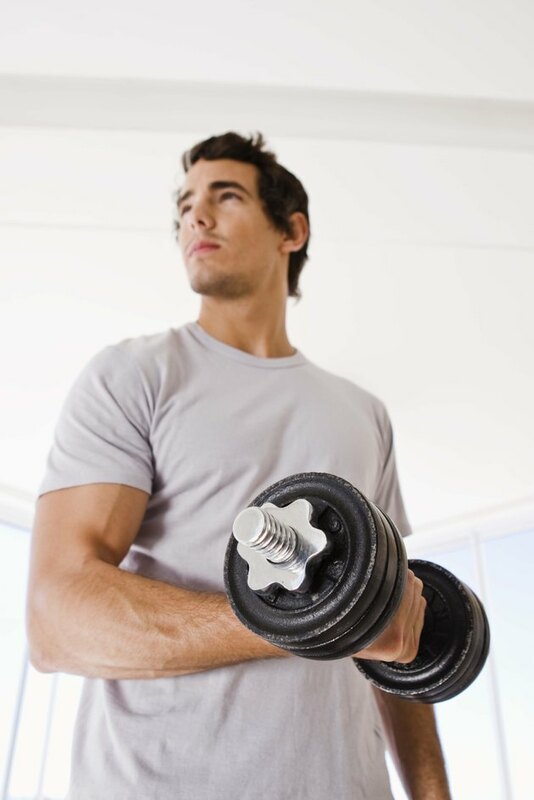 While weight training will be your primary focus, don't cut out aerobic exercise altogether. Unlike someone trying to lose or maintain weight, you will not need to do a cardio workout as often or as long, but keeping this type of exercise in your routine will improve your stamina for strength-training. However, be careful not to do too much, since this will burn calories and make it harder for you to gain weight. Hard gainers should hit the gym for aerobic workouts two to three times a week, performing the exercise at a moderate intensity level for 20 to 30 minutes. Exercising is only part of the weight-gain equation -- what you eat plays a vital role as well. You can lift weights all you want, but you won't pack on any pounds if you are using up more calories than you take in. To put on a pound a week, you will need to consume 500 calories more a day than your body burns. If this sounds like a lot, try sneaking calories into your meals by adding cheese, chopped nuts and dried fruit to items you already eat. Focus on adding more lean, protein-rich foods, which will help build muscle, while cutting out junk, as this will only cause you to gain fat. If you are unsure how much weight you should be lifting or how to do a certain exercise, consult with a trainer at your gym. Failing to use proper form or trying to lift too much too soon can strain your muscles, forcing you to take a break from workouts and prolonging your efforts at gaining weight. Also, some people's body types make it more difficult for them to gain weight. Talk to your doctor about how much you should weigh, as well as how quickly you should gain pounds.